This is the iPhone Apple fans have been waiting for – a complete overhaul of design and performance. The tenth anniversary edition iPhone looks beautiful, despite the notch at the top of the bezel-less screen, and is faster and lasts longer than any other iPhone to date. Top that off with face-recognition technology and you’ve got an absolute winner. The lack of the quintessential Home button doesn’t seem to take anything away from this new handset. Face ID works almost flawlessly, no matter what expression you wear, making Touch ID redundant. In fact, Face ID makes unlocking the phone quicker as well. While there has been talk of security issues with this new tech, there hasn’t been any serious incidents so far. The TrueDepth camera on the iPhone X is powerful and image quality on both rear and front-facing cameras is excellent. And then there’s the playful aspect of augmented reality. The iPhone X is AR-ready, with more and more AR apps appearing on the App Store every day. You can also charge the phone wirelessly, and get used to the idea of using a Lightning jack to plug in wired headphones or use Bluetooth ones. However, the all-glass body of the iPhone X is fragile. So if you’re looking to get yourself this handset, you might want to consider a good case as well. Other than that, Apple seems to have gotten pretty much everything else right with the iPhone X. 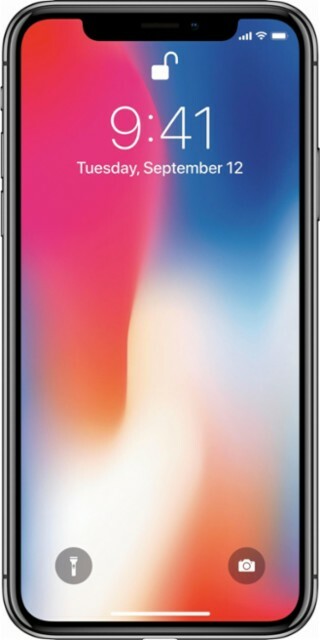 The iPhone X is an Apple fan’s dream come true – it’s a complete redesign of the iconic phone, with a brilliant screen, better camera system and high-end features.